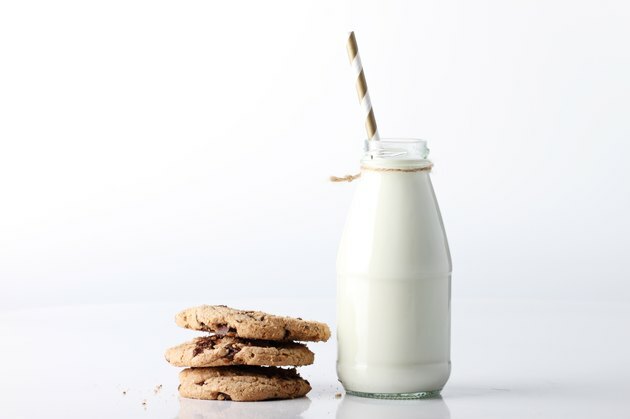 An estimated 30 to 50 million children and adults in the United States have a food intolerance condition called lactose intolerance, according to the University of Maryland Medical Center. People who are lactose intolerant are unable to digest milk and dairy foods properly due to the lack of an enzyme called lactase. Seek care from your medical provider if you experience severe lactose intolerance symptoms, as they may be signs of other medical issues, such as an intestinal infection or disease. In most cases, the more lactase you consume, the more severe your lactose intolerance symptoms will be. After eating several servings of dairy products, you may experience severe nausea accompanied by vomiting and appetite loss. Larger servings of dairy also take longer for your body to digest, which means you may experience nausea for several hours after eating milk or dairy. Contact your medical provider if you repeatedly vomit for more than 24 hours. Recurrent bouts of vomiting may increase your risk of dehydration and may also be a sign of another health problem, such as food poisoning or a viral infection. Excess gas may build up inside your intestinal tract after you consume milk or dairy products. Consequently, your abdomen may appear unusually swollen or your pants may fit tighter than usual around your waist. Bloating may also be associated with sensations of fullness or repeated flatulence, which can be both uncomfortable and embarrassing. Additionally, you may experience sporadic, sharp pains across your stomach due to abdominal gas. If these symptoms do not subside within a day or two of onset, consult your physician for further evaluation and care. Intestinal irritation caused by milk-based food products may result in frequent, loose bowel movements. Diarrhea typically develops within one to two hours following consumption of a dairy product in people with lactose intolerance. Watery bowel movements may also occur in conjunction with stomach pain, nausea, cramping, bloating or appetite loss. You may require additional medical care from your doctor if your diarrhea symptoms continue for more than one to two days. Prolonged bouts of diarrhea may increase your risk of becoming dehydrated due to excessive fluid loss from your body.